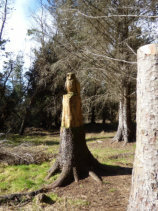 Every visit to the forest brings a new surprise, another sculpture, more new trees to replace those which may have fallen or felled through wind damage. Additional meandering paths laid down by the Friends of Dunnet Forest. The Scouts & Explorers and Beavers & Cubs take pride in planting seeds for new trees, and care for the seedlings in the Tree Nursery, located in the Forest. 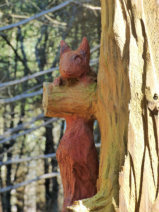 The fabulous log cabin, provides shelter and a wildlife resource for us all to enjoy. I recently learned there are 29 ‘Control’ posts throughout the forest creating a Permanent Orienteering Course. 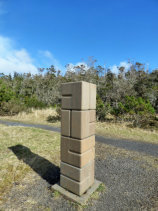 The Start / Finish post is just inside the entrance to the forest, about 30m East of the car park. I’m told, each of these control posts has a secret letter which should be noted as proof of my visit. I do like a challenge, or maybe a mission! Taking the ‘easy’ course for beginners, with only 4 Control Posts to locate numbering 1, 18, 19 and 29. I set off, map in hand (I had forgotten my compass!) Aha… I found a tree with no. 2 and another with no. 4 and no sign of the awaited post. I began to notice the many bird boxes located high on the trees, with Control number 1 nowhere to be seen. Retracing my steps, I returned to the Start and set off in reverse. Aha… I found Control number 29 and noted the ‘secret letter’, proof of my visit. And so my journey continues, from the wetland area at Post Number 29, I set off following the guidelines of my orienteering map… through rough open land to scattered trees, crossing two streams, and finding a ‘fence corner’, hey ho. I found Post number 19 next to the Tree Nursery. The bright yellow gorse just coming into blossom, I couldn’t resist popping into the dens, most likely made by the Scouts, Cubs and Adventurers. Oh, this is like being in the Girlie Guides all over again! On a roll now, and feeling elated, I continue to follow my map (in reverse) in search of Control number 18. Take the second right, and turn left at the next crossroads’. Now I’m confused and lost! Reading on, my map advises.. ‘follow the path into the trees, until you reach a five path junction’. More confusion. I double back, stride ahead, turn around and stumble upon the log cabin. There I meet a couple of boys with their Grandad. Couldn’t resist impressing them with my Orienteering tales of success! Well, I have found two Control posts and evidence on my camera! Impress even more when I point out the location of the swing and rope ladder! Onwards and upwards, and I stumble on Control Post number 18 by the fence corner, exactly where my map advised! Oh, so pleased with myself. On a mission now to find Post number 1. I know I’ve headed in the wrong direction, I know the totem poles are at the far north side of the forest, but aren’t they super. They’ve been here for many years and are the first sculptures I believe. Just too excited, as I stumble upon Control Post no. 8 YAY! Emerging from the forest with stunning views to the sand dunes and Dunnet Head in the distance, I take a moment to enjoy the sun shining brightly. Setting off deep into the forest once again on my quest to find Control Post number 1. And so back I go to Post No. 19, I can find that one easily by the side of the Tree Nursery… thank you Scouts & Adventurers, Cubs & Beavers. Re-tracing my steps to Post No. 18, I carefully follow my map in reverse, when hey ho. high five moment, only I’m all by myself, when I find Control Post No. 1. Yippee!!! Now, I may have accomplished the introductory route a little topsy turvy, but I am so very proud that I did it all by myself! I’m sure with Weyland’s help and a good compass, we shall venture again and discover the remaining 24 Control Posts. And if anyone wishes to take the Orienteering Course, I have the Map and Legend to guide you! Or like ourselves, on so many occasions before, enjoy a rather splendid walk.